“Rainbow Logic Arm in Arm with Remy Charlip” is Seth Eisen’s two-year labor of love and homage to his beloved mentor and friend. Remy Charlip was an unstoppable multitalented gay artist, dancer, performer, illustrator, costumer, and more. He collaborated with many of the giants of the pop art era yet somehow managed to remain in their shadows even after receiving his own accolades, such as two Obie Awards and being named a National Treasure by the Library of Congress. Charlip (RC) was never as famous as his peers, due in part to the diversity of his talents, yet he produced alongside them, equally gifted and as much a trendsetter. The volume of RC’s productivity–children’s books, dances, costumes, journals, drawings… is vast, and organizing his legacy into a multidisciplinary performance is no small feat. Where to begin? Eisen starts Rainbow Logic chronologically introducing puppetry, Remy Charlip’s parents, the 1920s, Brooklyn, New York, along with all the layering of details that RC was so fond of. 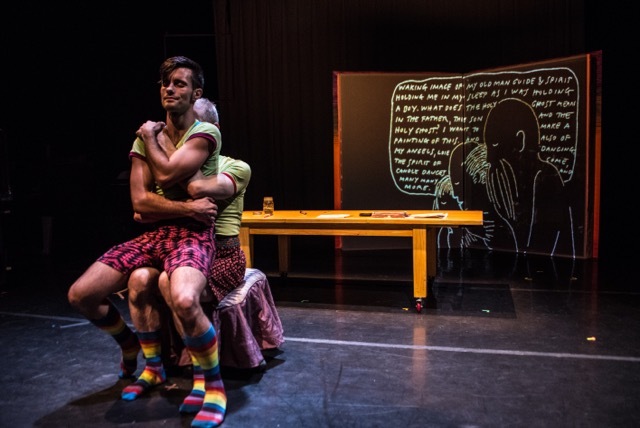 The stage is divided between a toy playhouse downstage—whose curtains open and close like a magic act–housing puppets, scenery, stick figures and paper cutouts. In front of the playhouse sits a video camera, which projects the ever-changing interior of the playhouse (Ian Winters, video designer) onto a square scrim upstage. Stage lighting (Jim Cave) is also projected on the scrim allowing performers to create an additional dimension when standing behind it–becoming part of the live action video projection. Behind the scrim they create various tableaus, while between playhouse and scrim the majority of performances take place. Colin Creveling–a talented circus performer–plays a young precocious RC to the striking Paul Loper, as his drunk father and Molly Shaiken, as the supportive mother. In time, all three performers impressively transform into all the other colorful characters that parade through RC’s fantastic life. Loper most often plays the “older” RC, with Shaiken frequently gender shifting into the nerdy, self absorbed, composer John Cage. Art aficionados will particularly enjoy the insider-art humor that is folded into much of the dialogue and characters. The opening family scenes appear the most like a work-in-process, lacking the rhythm and confidence that come in later episodes. Lighting is flat, uncomfortable pauses linger between dialogues; conversations that are sometimes blasted out by a Brooklyn soundscape playing in the background. Creveling’s usual agile movement appears tentative hindered by the puppet he carries as his doppelganger. Granted these early scenes have the weight of introducing so many different elements and are tethered by the imposed chronology. Relief and magic open up as the leads start taking on their multiple roles, gallivanting at a quicker clip through RC colorful history. Vignettes come and go, as do cameos of famous people, with Creveling at one point playing an office secretary speaking gibberish like a chipmunk on helium. He is spry in both movement and vocal range, and is energetically consistent throughout. Loper is solid as the aging RC, quoting RC as if written for him. The two of them flow beautifully together in act two when the young and old RC engage in a deft pas de deux that morphs into a third RC–the one in between. In fact, the entire second act seems richer, more relaxed and less linear even though it leads to RC’s stroke and passing. While “Rainbow Logic” presents the creative, wondrous and noteworthy arc of Remy Charlip’s life, in equally creative fashion, one might not know RC–the person—any better by the end of two hours. Even with several multifaceted interviews woven throughout, from an assortment of family and friends, an intimate connection to the person paradoxically feels missing. The young Remy Charlip is portrayed Peter Pan-like with an emotional range that seems much like the puppet in hand–unemotionally affected in any substantial way from the abuse and neglect perpetrated by his alcoholic father other than a sad face. Whether or not RC retreated into an imaginary artistic world because of the unloving nature of his father, or what psychological behavior that relationship set in place, isn’t clear. Similarly, his mother is presented as a saint who encourages his artistic path but was that all she was? Was she an enabler, overbearing, emotionally needy? Only once does the teenage RC express his frustration of being “his mother’s husband and his father’s father,” yet even that comes off more as amazement than anger. As this Peter Pan-ish figure, RC swings—literally at times, upside down on a hanging trapeze bar–from one episode of his life to the next, he meets and forms different kinds of relationships with the who’s who, up and coming avant-garde of the 50s and 60s. Among those art elites, are Andy Warhol, John Cage, Merce Cunningham, Lou Harrison, Robert Rouschenberg–all of whom were gay at a time when being queer wasn’t ok. Yet they mostly pass by like a dropped name, sometimes as one dimensional as the stick figures. The portrait “Rainbow Logic” paints of RC is created mostly by the company he kept, rather than from the intricacies and contradiction of those relationships. In doing so it leans more to the side of performance art than theatrical drama. Only in fleeting segments is tangible emotion delivered—real disbelief and confusion when Merce Cunningham fired RC from his company, grief and loss when RC (Creveling) performs a poetic lament to his dead mother and, in a piece about how his father didn’t love him (Loper.) “I am hungry and I am starved for it, and I bet you are too” exclaims RC at one point…Yes! Yes, even with all the artistic display that is so elaborately presented I want to know, who was Remy Charlip?